This entry was posted on November 2, 2015. Bookmark the permalink. 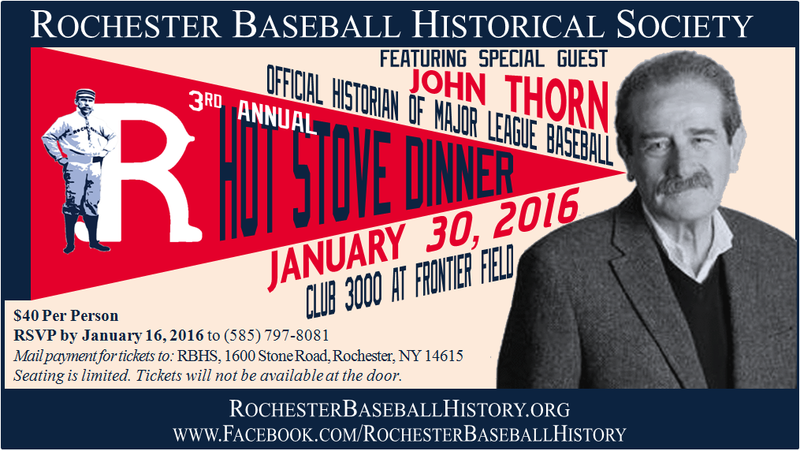 We are pleased to announce Rochester Baseball Historical Society’s third annual Hot Stove Dinner, featuring special guest John Thorn, Official Historian of Major League Baseball. The dinner will take place January 30, 2016 at Frontier Field’s beautiful Club 3000 in the suite level. Cocktails begin at 5:00 PM and dinner at 6:00 PM. Tickets are $40 per person. Please RSVP by January 16, 2016 to (585) 797-8081. Mail payment for tickets to: RBHS, 1600 Stone Road, Rochester, NY 14615. Seating is limited. Tickets will not be available at the door. John Thorn is the Official Historian of Major League Baseball. Apart from his creation, with Pete Palmer, of Total Baseball, he is often visible on TV and the web as a sports authority and commentator. He was also a major on-screen presence in, and chief consultant to Ken Burns’s PBS film, Baseball, and is now reprising that role with Florentine Films for RaceMan: The Life and Times of Jackie Robinson (PBS, 2016). Thorn co-wrote The Hidden Game of Baseball, which established alternative statistics later recognized and adopted as official by Major League Baseball, notably OPS. His many baseball books over the past four decades also include Treasures of the Baseball Hall of Fame, The Game for All America, and Our Game, a history of the game which also supplies the title for his twice-weekly blog (htpp://ourgamemlblogs.com). In 2011 Simon & Schuster published his major work, Baseball in the Garden of Eden: A Secret History of the Early Game. His work appears in the Boston Globe, New York Times, Wall Street Journal, and New York Times Book Review. He is editor of BASE BALL: A Journal of the Early Game, a scholarly annual.